Use the Coupon Code "Sentry" for $3.00 OFF each baton! While Supplies Last! Limited Time Offer. Free Navigator Light with order. ASP Sentry Baton 16 and 21 Inch or 26 inch are Less than lethal weapons designed with the security professional or motivated consumer in mind, the ASP Sentry 21" Friction Lock Steel Expandable Baton offers a moderately priced alternative to the ASP Friction Loc 4140 batons and features 4130 alloy steel construction with black nickel finish, an overmolded Strike Force Santoprene grip and accepts all ASP attachments. The business end of the baton is made of heat treated 4130 steel. The Sentry Tactical Baton has an aluminum cap and aluminum base retaining clip, making the overall weight lighter while retaining the strength of a heavier baton. The 21 inch baton weighs only 15 oz. and closes to carrying length of only 7.75 inches. 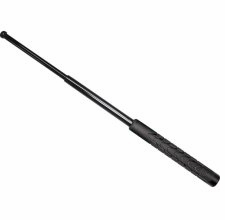 Function of the ASP Sentry 21" Friction Lock Baton is identical to that of the ASP 4140 Friction Loc Batons for self defense, compliance or training. Expands with a quick swing out or back and closes with a stabbing motion into the floor or other hard surface. Features: * First ASP Security Baton * Friction Loc Series Baton * Overmolded Strike Force Santoprene Grip * 4130 Alloy Steel Tubing * Accepts All ASP Attachments and can find a home in any of the ASP Sidebreak scabbards of appropriate length. You may also choose the 16 or 26 inch models from the dropdown menu. It may be against the law to own ASP Batons in your state or city. We do not know the law where you live.! It is the purchaser's responsibility to know and abide by the laws in your state and municipality. Pleasant experience, and will gladly return for future purchases. Product was exactly as described and at a fair price. Shipped in excellent condition. Zero complaints!